It’s a powerful sentiment, but less so in practice. In this country, not all voting opportunities are created equal. The “land of the free” has a shameful history of selectively listening to its citizens. Spoiler alert, they’re normally white. This continues today, with racist voter suppression tactics thinly veiled as necessary, bureaucratic policy. Last year, Georgia passed an “exact match” law. 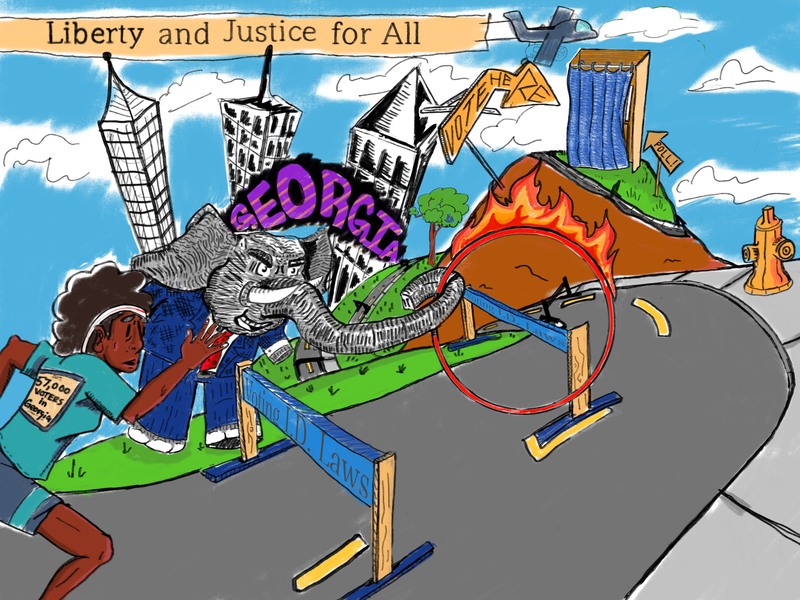 It requires all information — down to the punctuation — on voter registration forms be an exact match with the information on record at the Georgia Department of Driver Services or the Social Security Administration. With the “exact match” law in effect, Georgia Secretary of State Brian Kemp placed over 57,000 voter registration applications on hold. About 70 percent of the applications on hold belong to Black-identified individuals. It’s clear the policy only serves to target voters of color. Keeping marginalized groups from influencing the gubernatorial race could directly benefit Kemp, who has a long history of suppressing voters and doubles as the state’s Republican gubernatorial candidate. Since 2012, Kemp’s office has rejected or canceled over 1.4 million voter registrations. Many of the votes he is blocking in this election would likely go to his opponent, Democratic candidate Stacey Abrams. If Abrams were elected, she would become the first Black female governor in the history of the U.S. This July, Kemp purged over 100,000 Georgian voters from voting rolls through a separate Georgia law allowing the state to remove voters who have not participated in an election in the past three years. It’s yet another policy disproportionately affecting people of color, who are often less likely to vote regularly. of our democracy crumbles when the country silences its eligible voters. Voter suppression isn’t isolated to one state. The Supreme Court voted on Oct. 9 to allow a restrictive new voter ID law in North Dakota that significantly affects Native Americans. It mandates voters present an ID with a street address, and P.O. boxes don’t qualify. In an area where many Native people live on reservations without physical addresses, this is another piece of voter legislation that will reduce votes from already underrepresented groups. People say the U.S. is a place for equality. But last time we checked, equality isn’t adding renewed voter suppression to the long list of ways this government has wronged Indigenous groups across the country. fighting to retain her Senate seat. In 2012, she won by less than 3,000 votes. There are at least 5,000 Native Americans in North Dakota lacking the newly required identification, and most Native Americans in the state are Democrats. In a devastating way, voter suppression adds up. Republican politicians know every vote counts, so they are doing the most in their power to erase the votes that could count against them. This is one of the most important elections of our lives. It’s time for change. In every state, we need to show up at the polls to elect officials and approve propositions that promise an end to civil rights abuses. It’s imperative that everyone seeking change is allowed their basic right to vote. And although amended aspects of the Constitution grant women and people of color the right to vote, new policies prop up continued voter suppression. Every election, people of color, houseless people and individuals convicted of crimes see the power of their potential votes stripped from them. It’s time for this to change — it’s been time for over 200 years. We can’t afford to let policy makers write underrepresented voices out of decision making. We live in a stolen country with a system built by and for white male landowners, but that doesn’t mean in 2018, they can continue to have the loudest voices. There is too much to be said and too much to be decided. We must vote our way out of oppressive politics and organize until every group in every state can do so too.